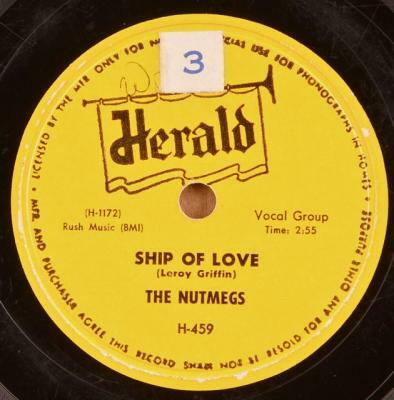 Big 1955 R&B hit for Connecticut Doo-Wop group, The Nutmegs. Condition: V,V-/V,V+; Plays fine, loud and strong, light surface noise. Even, overall moderate graying of grooves on "Ship Of Love." Scuffing/rubbing, tag on one label, slight warp-n.a.p.